Outdoor navigation meets touchscreen simplicity in Dakota 10. This rugged, palm-sized navigator boasts touchscreen navigation, high-sensitivity GPS with HotFix satellite prediction, and a worldwide basemap in one affordable, power-packed punch. Touchscreen navigation, high-sensitivity GPS with HotFix satellite prediction, and a worldwide basemap. Click to enlarge. 2.6-inch touchscreen with easy-to-use interface. Touchscreen navigation for the great outdoors. Dakota 10 makes outdoor navigation effortless with a tough, sunlight-readable, 2.6 inch color touchscreen display. 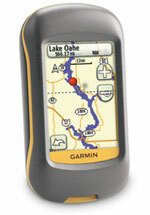 The interface is easy to use, so you'll spend more time enjoying the outdoors and less time searching for information. Both durable and waterproof, Dakota 10 is built to withstand the elements: bumps, dust, dirt and water are no match for this rugged navigator. Get into paperless geocaching with Dakota 10 by quickly downloading up to 2,000 caches, with information such as location, terrain, difficulty, hints and description--no more paper print outs and manually entered coordinates.